I tried to mod-migrate a question from meta.sf to here but I encountered an issue where I can't select meta.stackexchange.com as a target. If I select any "normal" site like "stackoverflow", "super [user]" etc., everything works as expected, but when entering "meta.stacke", I end up with a partial list of all sites starting with numbers or the letter A, but without the SE Meta in the list. I've tried this with Firefox on macOS Sierra and Ubuntu 16.04 and Chrome on macOS. We recently moved all child-meta domains to a <sitename>.meta.stackexchange.com to help with our move to HTTPS. This does mean that when you search for meta.stackexchange.com, all child metas are returned - as their URLs contain that fragment. The autocomplete only populates the top 10 results, which doesn't include Meta Stack Exchange. I don't see how we can fix this, given that the autocomplete should not return exact matches. 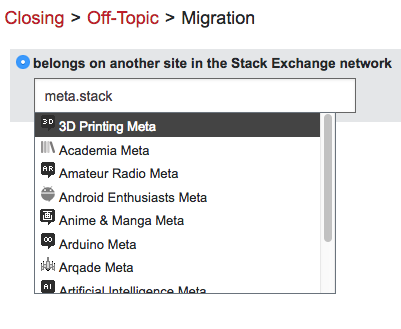 The work around is to drop the dot - searching for meta stack will give you far fewer results, including Meta Stack Exchange. Not the answer you're looking for? Browse other questions tagged bug status-declined migration moderator-tools ssl . Bug in reputation tab in stackoverflow?